Do you ever have days, or even weeks, where things just don't go the way you imagine they should? It's been one of those weeks for us. When things got challenging this week I started to despair about whether we were doing 'enough' school and I'd still be feeling that way if I hadn't remembered to take a look at the photos on my camera roll. First, I happened upon this book at the library over the weekend. 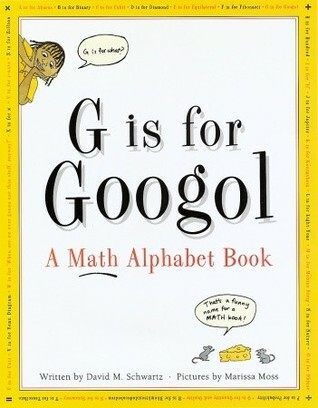 G is for Googol by David M. Schwartz is the absolute best math overview book I have read. Ever. I think it's the combination of humor and the way he works in multiple, connected concepts into each entry. 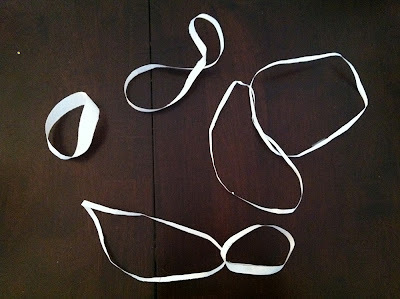 The entry on Moebius strips, for example, included a little lesson on topology and inspired us to try out a few things, with my daughter exclaiming "right now!" while I ran to get the paper, tape and scissors. On the left is the Moebius strip and, moving clockwise, what the strip looks like after being cut down the center, then cut in half again, and then the result of not cutting around the strip down the center and instead cutting one third from the edge. "R is for Rhombicosidodecahedron" (kid loved learning how to say that) "N is for Nature" (a great re-introduction to Fibonacci numbers) "K is for Konigsberg". We've been reading three or four entries a day at meals. Each one has something interesting to think about or do or introduces a concept with a lot of passion and verve. My recent favorite is the entry under V, which is perhaps the only math book I've found so far to include 'book readers', 't.v. watchers' and 'underwear poem-writers' in the same Venn Diagram. I think Mr. Schwartz really knows the mind of a child. Then there was a day when we just had to head outside, take a trip to the children's science museum, whatever, just get out of the house. While we were waiting for it to open we hung around outside. "Hey!" 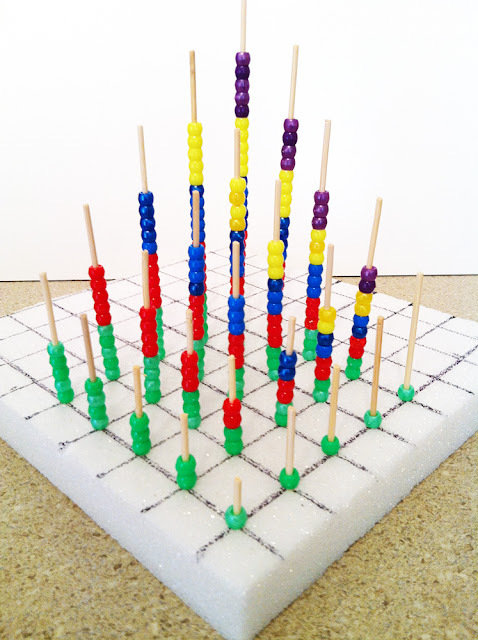 I said, "What's the very fastest way you can figure out how many small squares there are?" 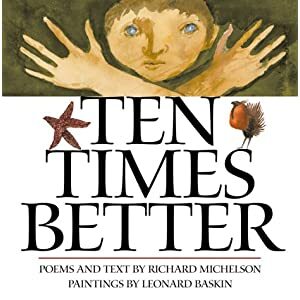 She wasted no time counting ten across, ten down and skip counting by tens. "100!" "How many squares make the diagonal?" 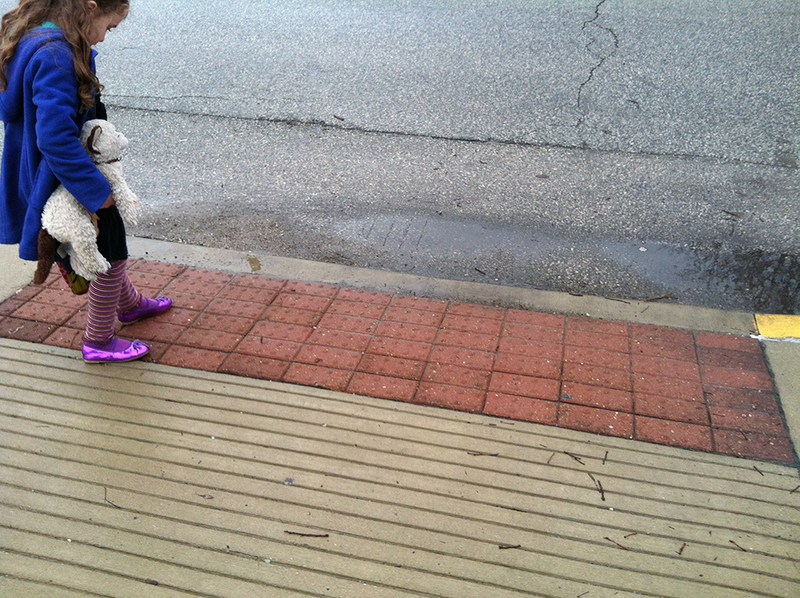 This one she initiated all on her own. 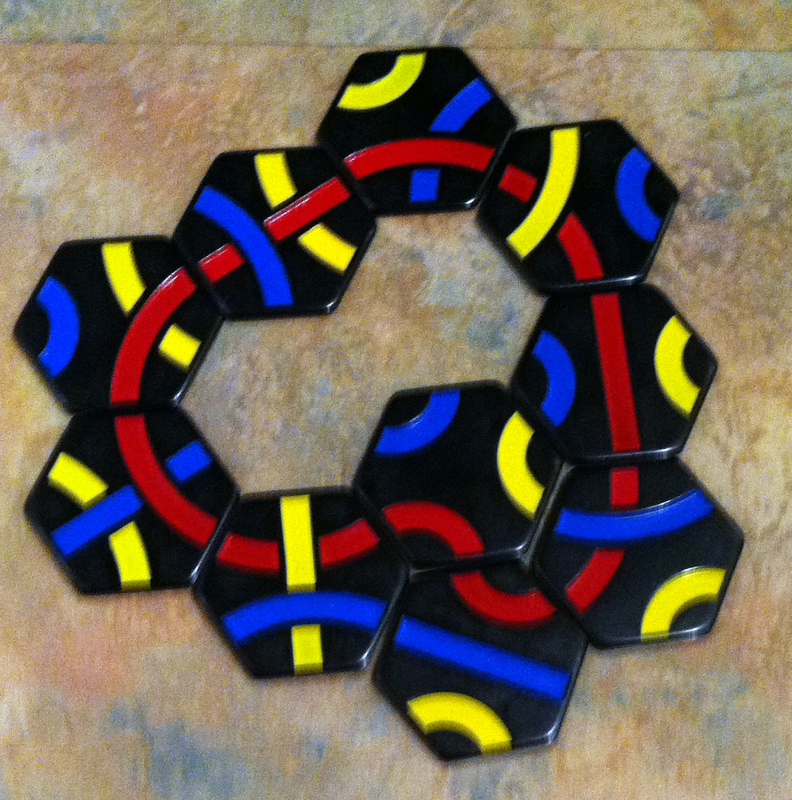 While we were at the science museum I found an introductory set of Tantrix for about $6.00. It said for ages 8 and up, but my seven-year-old (who is not a puzzle person, or so I thought) really loved the structured challenge of creating loops of increasing size and turned out to be a whiz! The instructions said the approximate time for solving the 10-piece red loop was 20+ minutes, but she did it in under five. 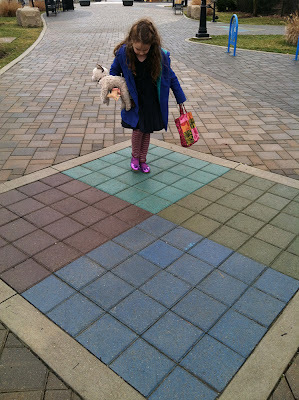 I love the hexagon pieces ("T is for Tessellate" thank you very much!). Have you ever seen Vi Hart's videos on spirals? I'd seen them before but, on a whim, showed them to the kid who was impressed enough to sit through all three on the subject. 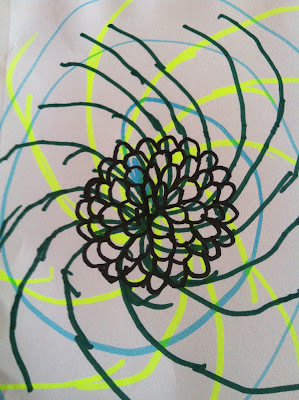 Afterwards, she rustled up some permanent markers, drew the spirals first (which inverts Vi's process) and drew in the petals following that pattern. I think it approximated pretty well what Vi Hart was trying to do. So, for a week where we were at loose ends and lost causes, it sure seems like we actually have something to show for showing up. Thank goodness for my camera. A friend of mine has a couple kids in kindergarten right now. He asked if I had any recommendations for "online computer games for arithmetic, patterns, creative math exploration." Why, yes, I think I do! 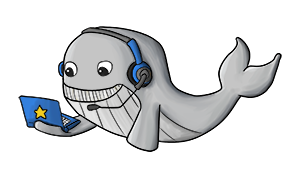 Following is an annotated list of some of my favorite interactive online habitats for a wide range of ages, including parents. However, I think I'll start with a list of activities that are not computer based. I'll be the first to admit that I'm a little biased toward hands-on, not-virtual learning, especially for the primary grades; children's bodies really need to be involved in the learning process, especially math. Also, although my kid has some computer skills, she is basically raising herself as a luddite, which is fine with me for now. She's never been drawn to the computer, even when I specifically show her something I think is fun or cool. So, many of the games and interactives listed in the online category, below, are places that I go to get activity ideas to adapt for her off-line lessons or to grow my own math understanding or just for inspiration. I don't know where we'd be this year without the endless Shut the Box tournaments of last year. I attribute at least half her mental addition skills to rolling two dice (which can make up to 12) and finding different ways to make the rolled number. I attribute the other half of my daughter's mental addition ability to UNO. It's a classic game that we played speed style all last year. And, at the end, the winner got to add up all the points she won from her mother opponent who always remembered to chant the UNO Point Tallying Mantra: "Find your tens!" 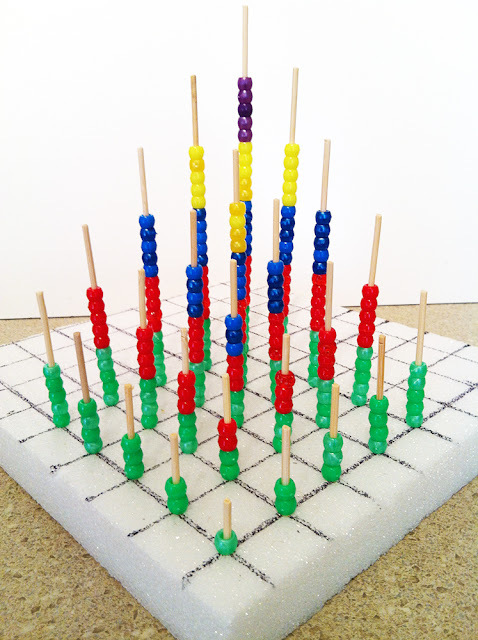 Peggy Kaye's book Games for Math has LOTS of easy and inexpensive ideas including Nine Men's Morris which is sort of like a more complex and moveable tic tac toe (strategy, logic). 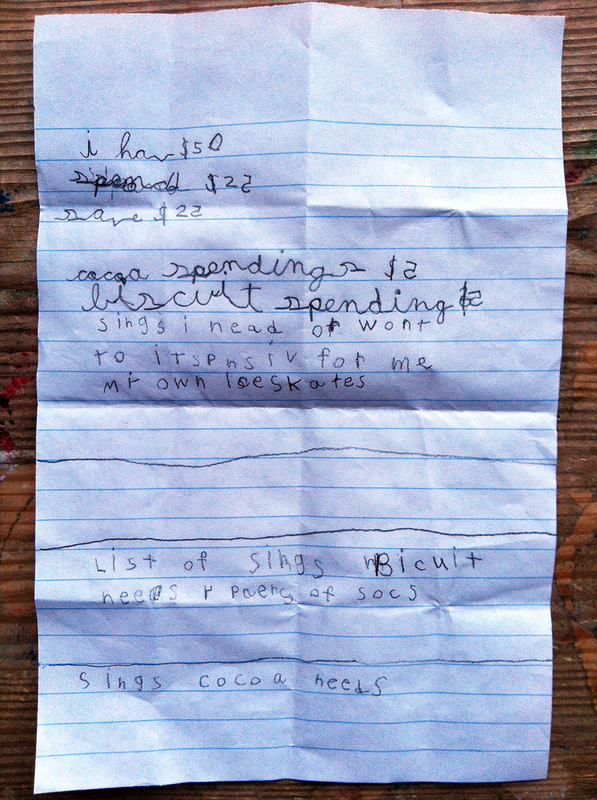 Variations on "sort and count the change jar" along with "save and spend" from about the age of five means that now, at age seven, the child is a whiz at money math (also known as adding and subtracting 10s, 100s and 1000s). And, of course, The Game That is Worth 1000 Worksheets from the Let's Play Math Blog -- for the littles all the way through high school. This fall we used a version that was a combination of sums and differences. 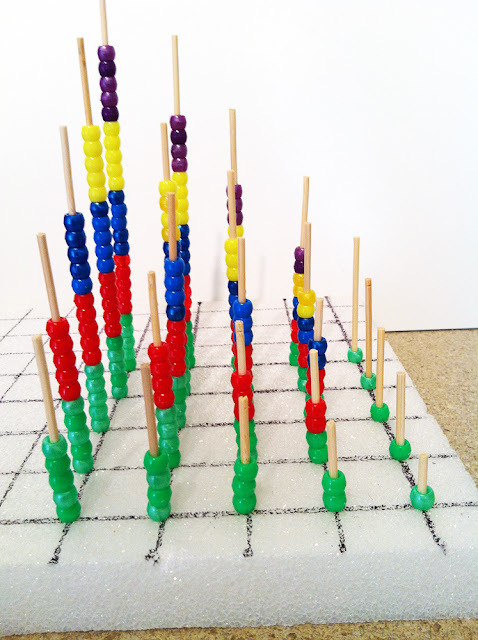 National Library of Virtual Manipulatives: Truly a class act and a challenge for all ages. Math Pickle: This link takes you to a large library of interesting videos and ideas organized by grade level. 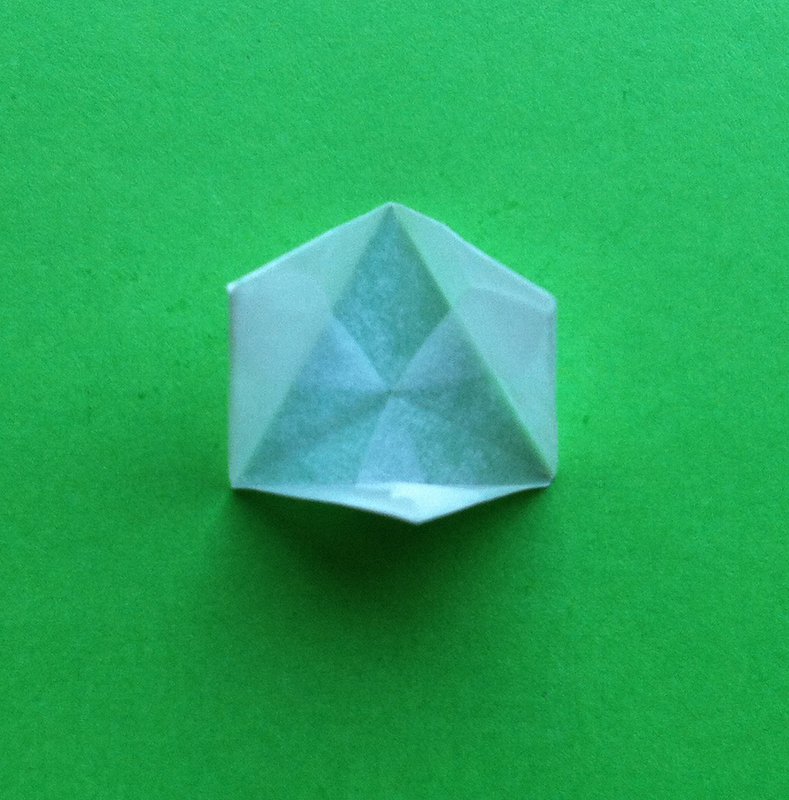 Kaleidograph: I first found this toy and played with it online, and then I bought the real thing for Christmas. Both the online and hands-on versions are great but, no surprise, I find more meaning in the actual toy. From my childhood memory bank, a classic Sesame Street clip with a lovely song: Two Little Girls and Their Little Doll House. 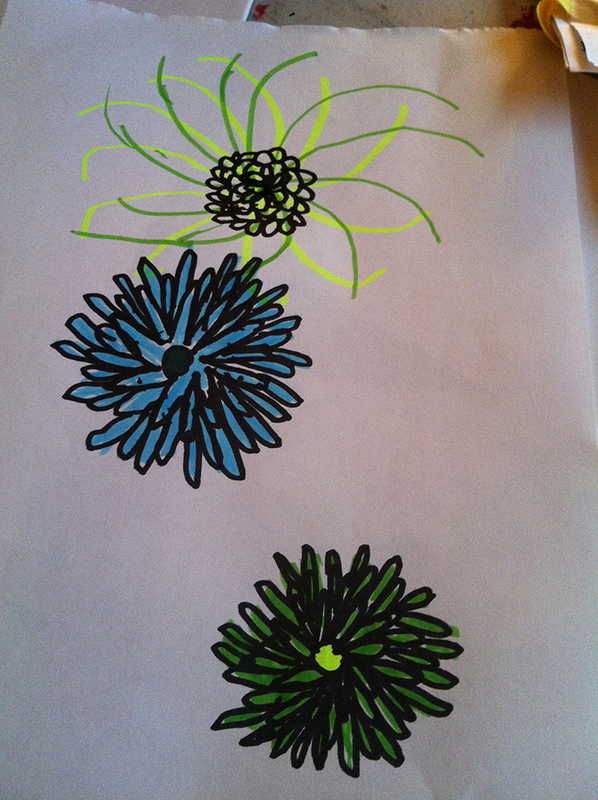 My adult eyes immediately saw one-to-one correspondence but my little girl heart remembered something different. Scale of the Universe 2: I have no words for this interactive graphic other than just GO. You can turn off the music if you want. I've included this link to Planet Seed/Math Puzzles for Kids because I don't want to forget about it. It was on a long list of bookmarks already. Puzzle topics include combinatorics, algebraic thinking, topology, probability, etc. Games from Freudenthal Institute look great, and they even have a star interactive! Make your own isometric dot graph paper here. These and the other dot graph paper you can print out are fun to leave around the house so kids can make designs whenever the mood strikes. Math cats! Need I say more? 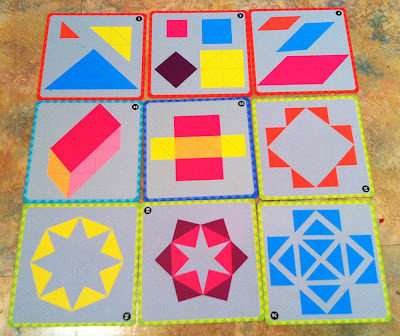 I personally love Symmetry Artist from Math is Fun and my daughter actually liked playing with it for a while. 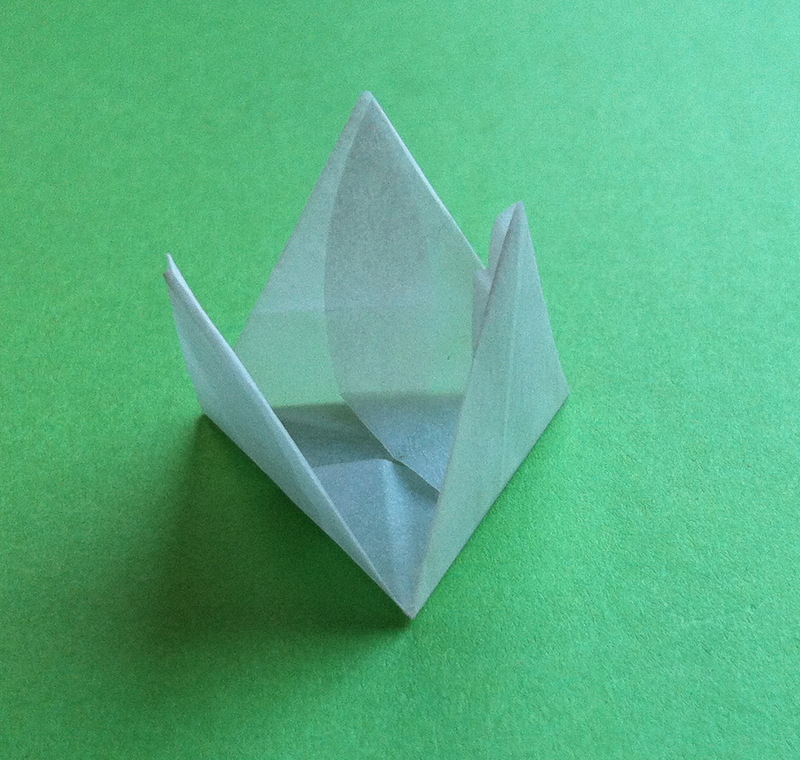 It's a great way to really experience the differences between line and rotation symmetries and you can print out the designs you make at the end. 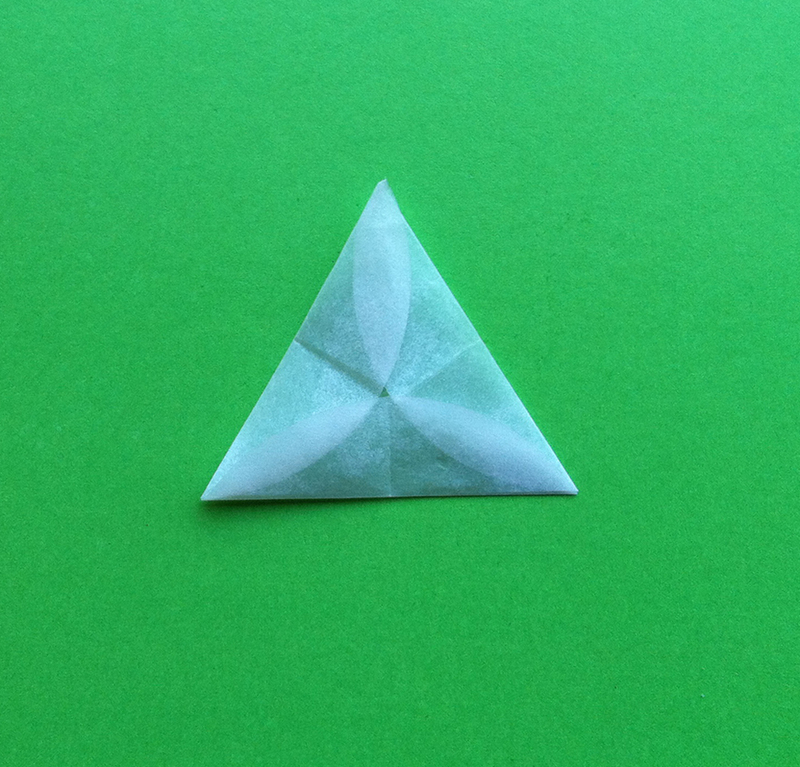 And, you really cannot miss this triangle interactive from the Triangulation blog. Truly. Run, don't walk. To close it out, here is a lovely and thought provoking classic Sesame Street animation with music by Phillip Glass called The Geometry of Circles. Hey friends! I am thrilled to announce that I have been invited to be a regular contributor over at the Moebius Noodles blog. Not heard of Moebius Noodles yet? It's a fantastic resource for adventurous, meaningful math experiences for young children and their adults and has been an incredible resource in my own journey to math. My first post Hidden Math: Book Edition is up now! It includes two of my favorite children's books that have way more math in them than I first realized. 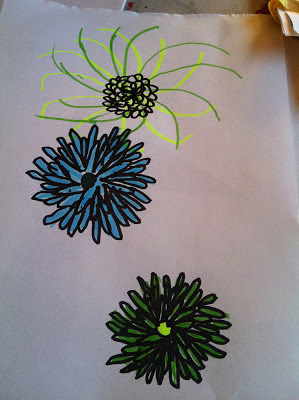 There's also a new post just today by Yelena on a similar theme. 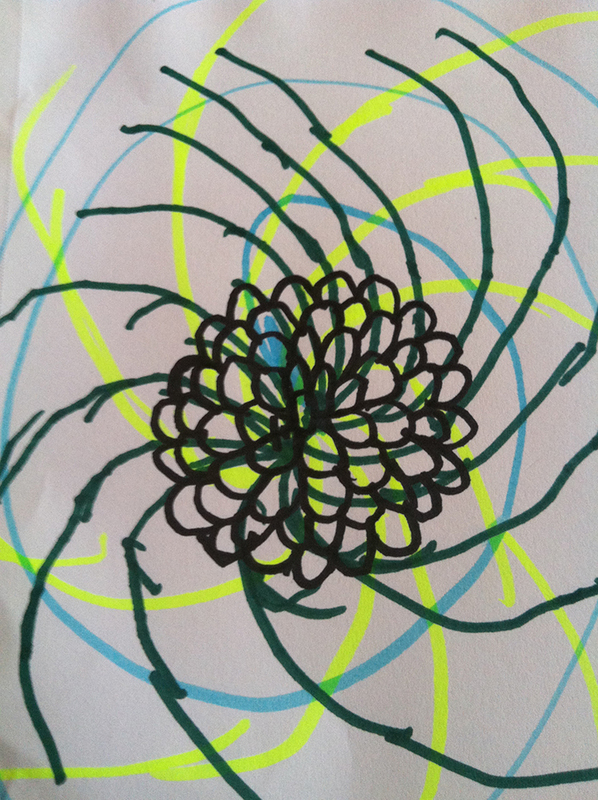 Her post is called Math Goggles #1: Math-y Librarian and it highlights all the cool math she and her son found inside a beautiful library in her city. Truly, I don't know where I'd be without Moebius Noodles (and other great resources like Let's Play Math and Living Math). In the last year or so I would never have grown my math eyes or moving past a life-long math insecurity that started back in kindergarten with a bumblebee matching worksheet. It was so utterly alarming and confusing to my five-year-old self that I can still remember that moment like it was yesterday. 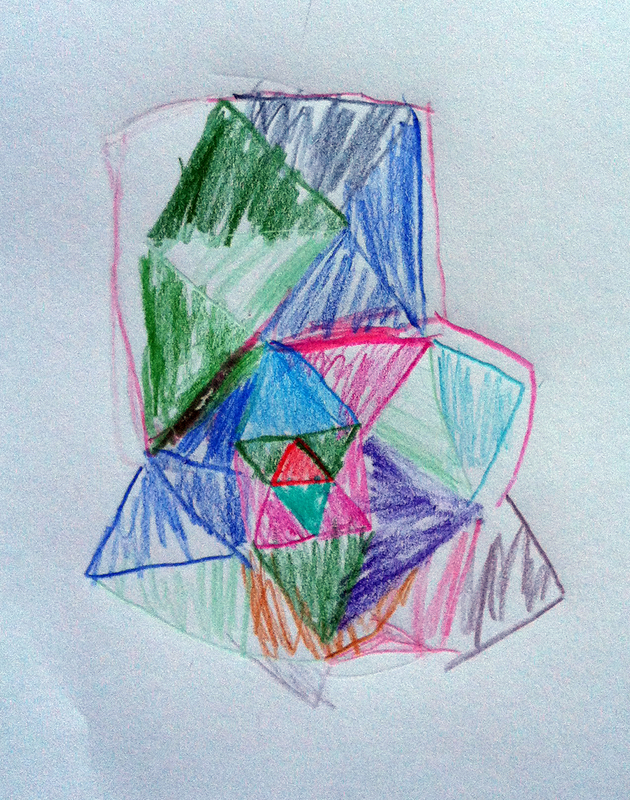 Today, however, relearning math slowly but surely along with my seven-year-old daughter has softened the edges of that memory. And, even better, I know that my strategy of focusing on first-order experiences, hands-on making, math games, living math books and sidewalk math adventures is bearing fruit. Just today my seven year old (who is currently building competency with number multiples) stated confidently that not only does she "likes math" but that she is "good at it, too! Yay for having fun with math and thanks to Maria and Yelena at Moebius Noodles for inviting me to join the adventure! Q: When is a 10 not a 10? A: When you're seven years old and you've just finished counting all the dimes in the change jar (91). You've successfully made an array of ten dimes in nine rows. There's one dime left over. You count each row of ten: "Ten, twenty...ninety..." and then you look at the lonely little dime and say, "And ten more! 100." After a hugely frustrating argument conversation about how dimes can be both coins and amounts, your mother ends the lesson (that was, honestly, a little too long but she pushed it a little since it had been going well up until that point) and goes off to wash dishes or sweep the floors or do laundry which is what she does when she needs a little space and time to think something over. It's at that point when your mother thinks back to something she read about fractions and units in this article from the MAA. And to a fabulous video lesson by Christopher Danielson and produced by TED-ED on units called One is one...or is it? 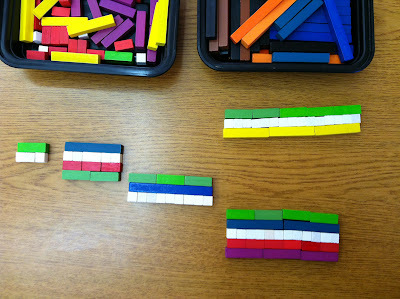 She also thinks back to a post by Julie on using Cuisenaire rods for a factoring activity, and, finally, to a book called 1+1=5 that she read about in this Moebius Noodles post. She thinks and she thinks, for days, actually, and then comes up with a very simple worksheet she titles "Unit Equations!" The exclamation point is intentional because, really, the world of numbers is an exciting mystery to be unlocked, whether you, the seven year old, know it or not. Then the questions get a little mysterious. What does your mother mean by "5 whites = 1 _____"? That's when your mother pulls out the Cuisenaire rods. You've not really played with these for over a year, but you 'get it' right away. Not only that, but you sail through the other five questions easily. What you don't know is that your mother was judging for frustration tolerance level during that activity and has decided to see if you can go a little further. She worked up a little activity on Saturday night which included finding the factors of each factor of 3 up to 15. The basic instruction is that, no, we're not adding, we're finding multiples. 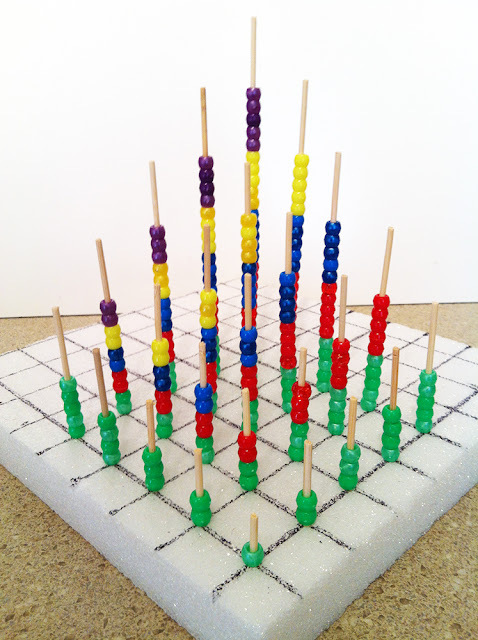 Each row of blocks must be exactly the same length (thanks Julie!) and each row must be a different color. 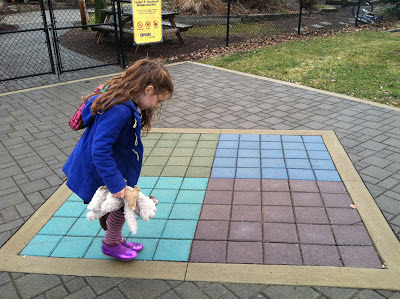 This activity, overall, is in the 'just-right challenge' category, but there is still some confusion. 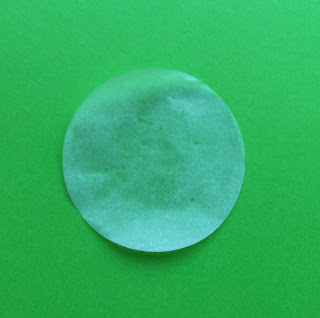 Two light greens (2 x 3) is the same as all whites (6 x 1) is the same as reds (3 x 2) is the same as dark green (6 x 1) which looks blue in the picture. "What does that mean exactly?" you ask. Your mother stands the dark green rod (6) on its end and says, "This rod is 6. There is one rod to make six. So, that's 6 one time. 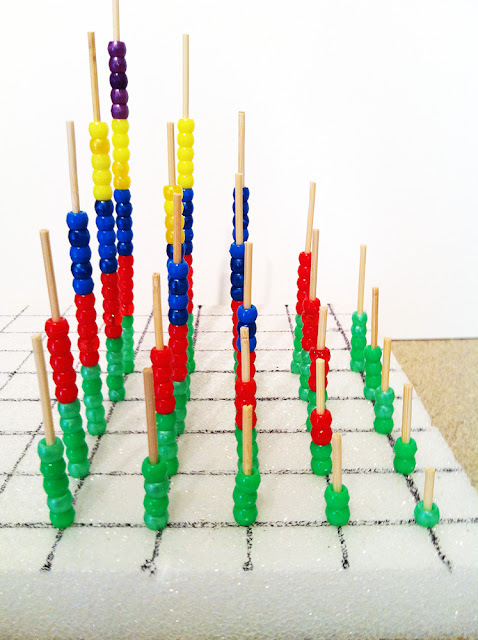 The white rods are each 1, and there are six of them. So, that's 1 six times. The funny thing is," and here your mother pauses, "...can I give you a super big word? It's called the commutative process. That's just a fancy word that means that no matter what order you multiply or add numbers, the result is the same." And, as your eyes do not convey complete understanding, your mother continues, "What that means is that even if there are two 3-rods or three 2-rods, they are both the same total length." From there, the activity proceeds wonderfully, all the way up to five 3s, and when it is all over, your mother asks hopefully, "So, what did you notice while you were doing this activity? And the seven year old replies succinctly, in her sweet voice that resembles nothing of the frustrated girl from last week, "That one thing can also be something else with many parts." 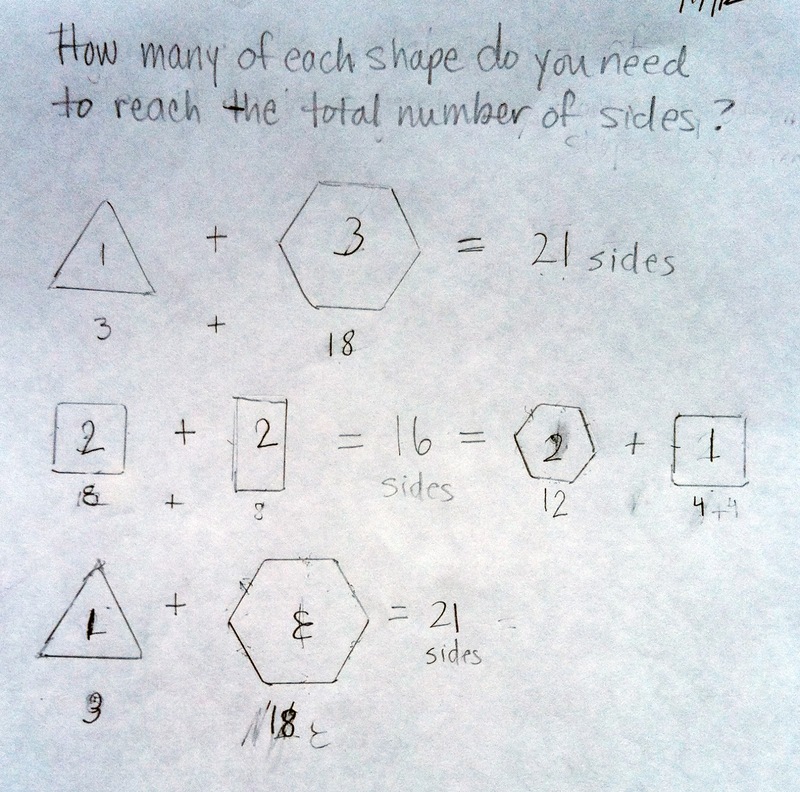 There are times when I doubt my approach to teaching and learning math with my seven year old daughter. The approach relies heavily on having faith in a learning process that cycles through input-conversation-incubation-inspiration-output and back around again. Every time I wonder if there's anything sinking in, or think that we're not doing 'enough' of the 'right' kind of math, I invariably run across jewels like these which put my mind and heart at ease...at least until the next fallow period. 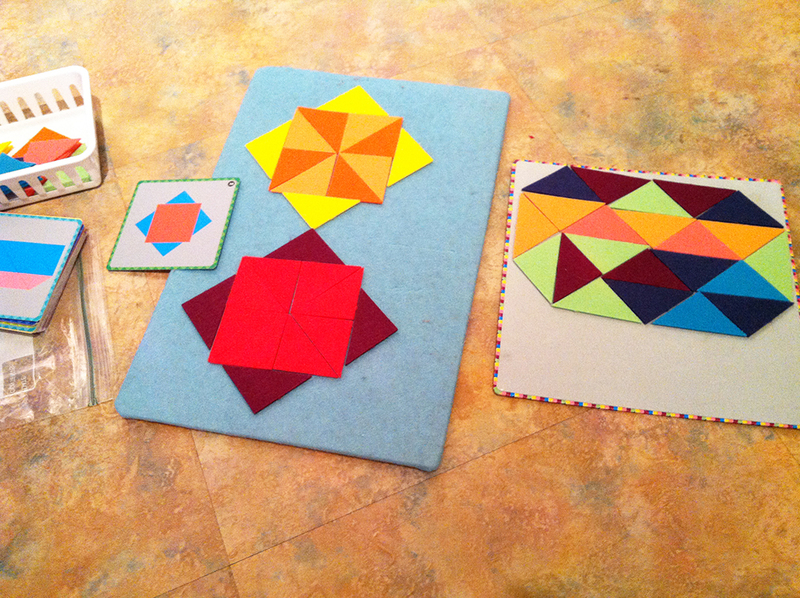 A week ago we were both playing around with a nice Christmas gift of a felt board, colorful felt triangles and some awesome design cards. 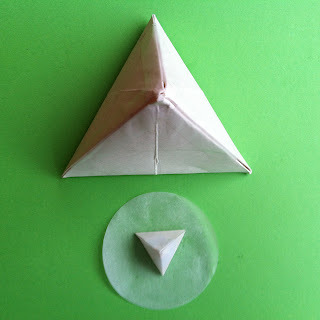 Yesterday I challenged her with some of these designs and watched her approximating and adjusting angles, creating strategies for reproducing the designs, turning and flipping the triangles, and predicting the growth of the triangle pattern in the upper left corner. Today I found this on the making table, buried under some other projects. 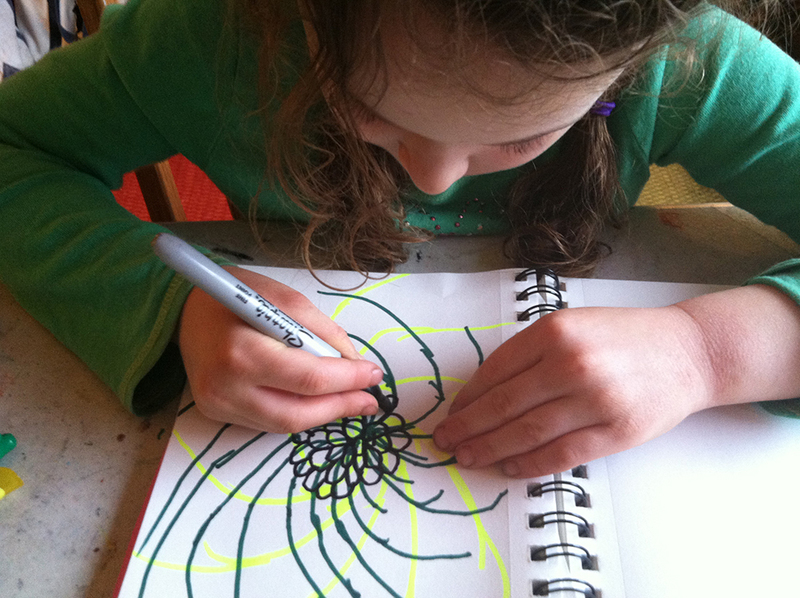 It looks like she was drawing (mostly) isosceles right triangles, y'all. Awesome! Kid: "Because he has four legs, silly!" Me: "But pairs come in two...does Biscuit have eight legs?" Kid: "Oh, right! He'll need two pairs of socks!!" We do all kinds of math these days -- reading living math books, games, design activities, drawing, noticing things when we go out, engaging in loooong conversations about the fate of her Christmas money and, yes, some workbook stuff. Taking the long view, I suppose that what I want most for her is that math becomes both useful and personally meaningful for her. I think today proves we're headed in the right direction. I'll start right out by saying that I'm pretty sure this was not the right activity at the right time for my 7.5 year old darling girl, but I did learn a lot about where her mathematical thinking is right now, which is always helpful. 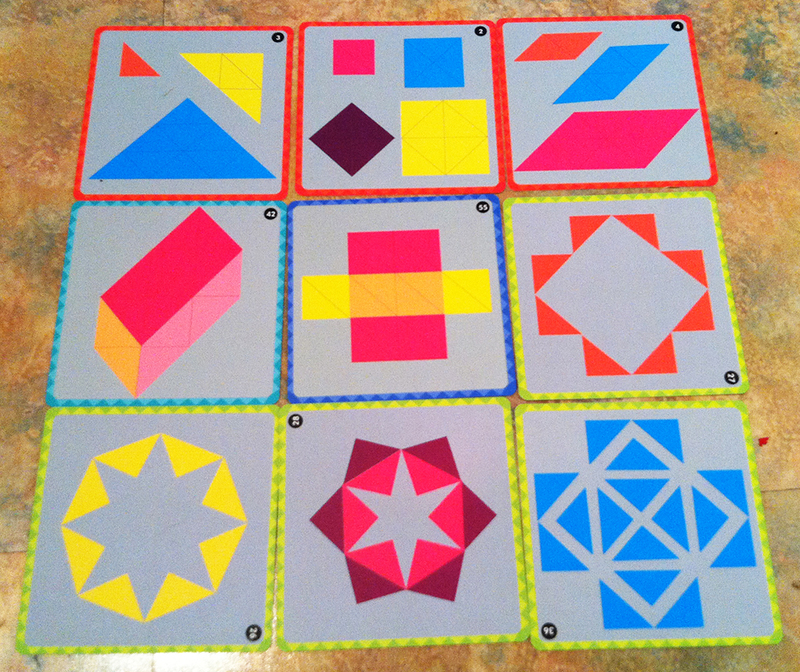 Back in November I bought a travel set of attribute blocks. We haven't done much with them yet, but after looking through the little activity booklet that came with it I found an activity that piqued my interest. 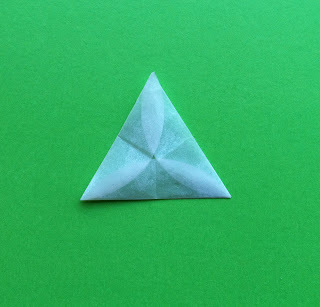 It had to do with figuring out how many blocks of a certain shape (or combination of shapes) you would need to have to get a total number of sides. 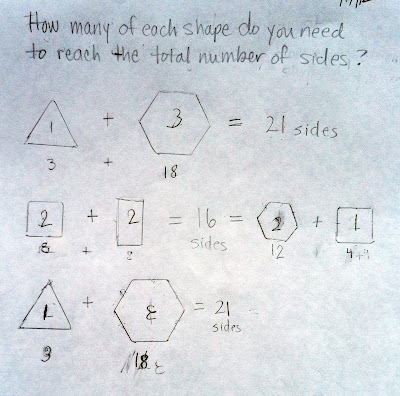 It looked vaguely algebraic to me but was presented as a mental math activity. So, I thought I'd create my own version of the activity on paper to make it a little easier to follow and to visually reinforce the differences between shapes. This is the first worksheet I made. 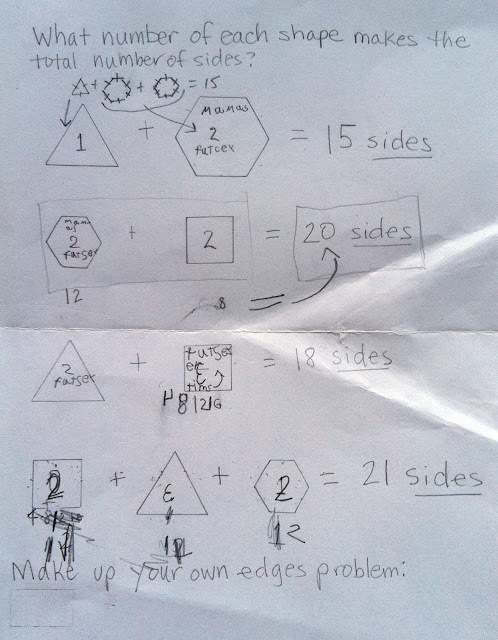 In the first example I labeled the triangle with a 1 (meaning one group of three sides) and she had to figure out how many more hexagons made it add up to a total of 15 sides. The second problem also had one shape already labeled, but in the final two problems I left it to her to figure out how many of both shapes. You can see little pencil marks around the shapes at the bottom where she counted the sides one by one and then made notes for herself. She was not completely happy with this activity (and was in a bad mood, distracted by whether the word 'futzy' was an insult or not). Grumpy or not I think it really stretched her capacity in a good way, well enough for me to try again. 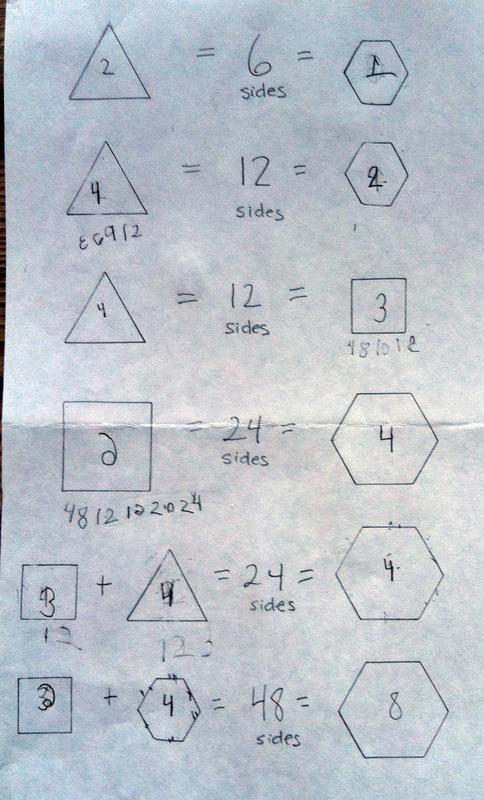 In the second iteration I asked her to write the total number of sides under each shape which I think really helped. It was easier for her this time around. You also might notice that I rephrased the question a little. Then the holidays interceded with math learning. 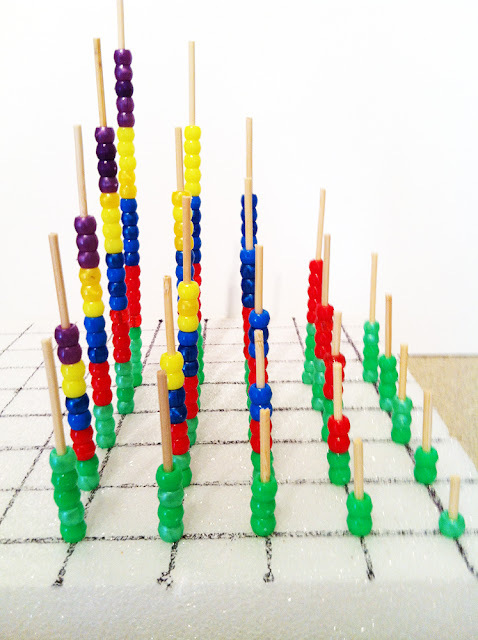 Over that time, though, I did some thinking about how perhaps this kind of activity could be used to reinforce the concepts of multiples and the commutative property. 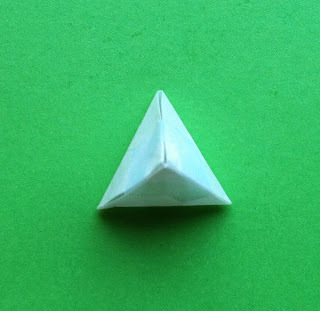 For example, 4 three-sided shapes (triangles) have the same number of edges as 3 four-sided shapes (squares or rectangles). I also wanted to continue to stretch her idea of what the equal sign means; not necessarily a result, but a relationship -- various expressions of the same idea. Here is the third activity. In it I intentionally grew the numbers from 6 to 12 to 24 to 48. 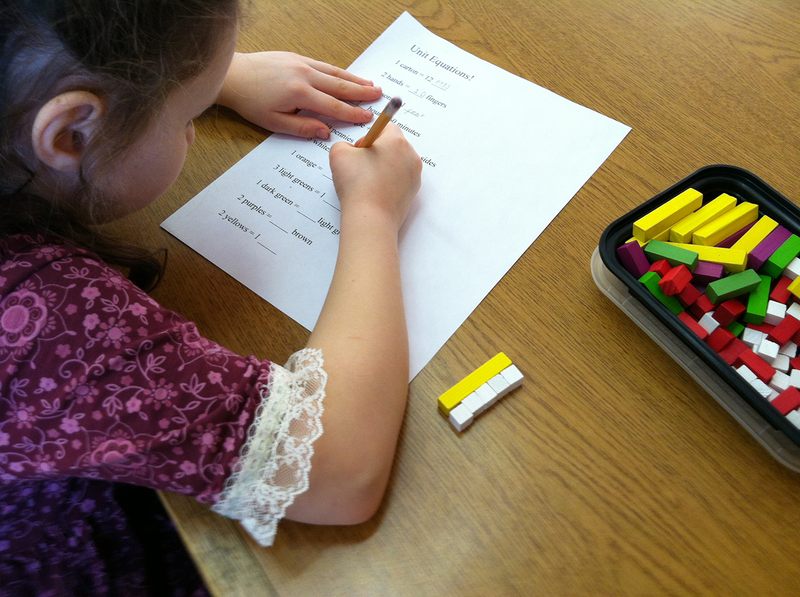 This time her strategy right out of the gates was skip counting whole groups of sides to work toward her answer instead of counting individual edges. This means to me that somehow in the last three weeks her brain has begun to 'group' with more facility. I think this because, in the same time period, she has also experienced a huge jump in her reading abilities -- from having to sound out familiar words as if they were new every time to simply looking at a word and knowing what it says. The math concept of 'grouping' and the reading concept of 'chunking' are essentially the same skill -- smaller items grouped into a larger whole. I saw that click into gear today with my daughter as she went to skip counting unbidden. Anyhow, she moved through this last activity fairly quickly until the last two problems. After it was finally over she proclaimed, "That was hard! I hated it! Forty-eight is such a big number!!" That proclamation was revealing to me -- at this point in the game she's got facility with multiples of 0,1, 2, 3, 4, 5, 10 and 11. The larger numbers are still a lot of work in terms of multiplication. Being able to decompose a number like 48 was just too much at this moment in time. Ultimately, I think it's a call to put on my own brakes and, instead of trying to rush us forward, really dig into the mysteries of number composition and decomposition. I know numbers are my weak point, so this will be good for me personally as well. Epilogue: After drafting this post this afternoon and then leaving to let it sit for a while I ran across the multiplication card game called Snap it Up which I found a month or so ago while at Goodwill (read about moreof my thrifted math here!). I decided to give it a try and what do you know? It was fun for both of us! One interesting observation was that when I said 'what's x times y' she'd give me a blank look but when I said 'what are two fives...' or 'how many tens make eighty' she totally got it. I love it when the math stars align for us like this. It happens a lot, actually, but I am grateful each and every time.